Flowers and candles are placed in front of the restaurant on Rue de Charonne, Paris, Nov. 15, 2015, where attacks took place on Friday. In claiming responsibility for Friday's coordinated terrorist attacks in Paris, Islamic State militants said they carefully studied the targets for the shootings and bombings – a rock concert hall and restaurants, some in ethnically mixed areas. For 27-year-old musician Olga, who turned up Sunday at two popular restaurants in the Rue de Charonne in Paris’ 10th arrondissement to lay flowers for her dead neighbors, none of it makes sense. “I don’t understand why this happened, why these people were killed,” said the mother of two toddlers, with a violin strapped to her back. “I am carrying my violin because I believe music will protect us,” she added forlornly. She isn’t alone among Parisians struggling not only with grief, but bewilderment at the carnage inflicted in the French capital by French and Belgian-born militants, along with two Syrians. For Parisians, the terrorism that has struck the city appears utterly senseless. But analysts say there is a highly dangerous, macabre logic to what Islamic State militants are trying to achieve, and warn that overreaction by Western governments and enraged citizens will aid the terrorists. Part of the answer lies in a 10-page editorial in the IS online magazine Dabiq posted last January, says anthropologist Scott Atran, who has written widely on terrorism. And that is what IS is trying to make happen, Atran says. From the point of view of IS strategists, the locations of Friday's attacks make perfect sense. They are seeking to provoke deeper divisions between Muslims and non-Muslims in Europe, forcing the latter to overreact as the terror becomes ever wilder and more extreme, thereby leaving the former with no choice but to join the jihadist camp. “The greater the reaction against Muslims in Europe, the deeper the West becomes involved in military action in the Middle East, the happier ISIS is," he says. "Its key strategy is finding, creating and managing chaos." And to exacerbate antagonism toward Muslims in Europe, the more outrageous the targets, the more likely the attacks will provoke Western governments to react and fuel the rise of right-wing nationalist parties demanding more action, according to Atran. 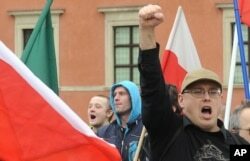 FILE - A supporter of a right wing organization gestures, as others shout slogans during an anti-migrant rally in Warsaw, Poland, Sept. 26, 2015. A continent already on edge not just from terrorism, but from the huge wave of mostly Muslim refugees fleeing conflict in the Middle East and Horn of Africa, is feeling increasingly overwhelmed and at a loss — something anti-immigrant right-wing nationalist parties are already feeding on. Counterviolence, by nationalists or just angry ordinary citizens, is something police forces across Europe are anxious to head off. Within hours of last week's terror attacks in Paris, police in Rome not only increased their presence in the center of the Italian capital, including at tourist landmarks like the Colosseum and the Spanish Steps, but also at refugee centers, fearing that Italians angry about what happened in Paris might start attacking asylum-seekers. Signs of far-right anger were on display in France. In the northern French town of Lille, a peace demonstration Sunday was disrupted by supporters of far-right politician Marine Le Pen, who declared in the wake of Friday’s attacks that the French “are no longer safe” and called for the closing of mosques. The protesters, armed with flares, displayed banners reading “Throw out Islamists,” and shouted Islamophobic chants as police moved in to contain them. Charles Grant, director of the Center for European Reform, a pro-European Union research institution, sees a congruence of interests between far-right anti-immigrant politicians and the Islamic State. 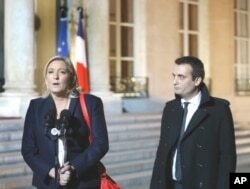 French far-right party leader Marine Le Pen , left, addresses the media with Florian Philippot after a meeting with French President Francois Hollande in Paris, Nov. 15, 2015. Grant argues that jihadist militants want to provoke far-right politicians like Le Pen, leader of France’s National Front, who even before the attacks was riding high in opinion polls. “Islamic State want to get Marine Le Pen stronger," Grant says. "They want far-right attacks on mosques and a warlike ambience in Western countries, because the more Muslims are persecuted, the more Muslims will be motivated to pick up arms and fight in western Europe. For Europeans, holding their nerve may become much harder in coming weeks. In London Monday, British Prime Minister David Cameron told the BBC that British intelligence services had thwarted seven attacks in the past six months alone. Serbian police officer attempt to organize migrants queuing to get registered at a refugee center in the southern Serbian town of Presevo, Nov. 16, 2015. Alarm is spreading to other European countries. Neighboring Italy increased its level of security even before last week’s attacks following the discovery that a jihadist veteran had managed to slip into the country on board a migrant boat before being deported back to Tunis. The fact that Islamic State militants are prepared to go for easier and easier targets, Atran says, makes it impossible for security services to protect everywhere, forcing them to mount scatter-shot raids on the homes of an increasingly wide net of suspected Islamists.